Weligama is a popular tourist destination in the southern coast of Sri Lanka and famous for its stilt fishermen; as the name suggests, fish while standing on stilts. 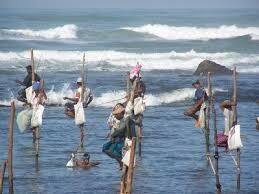 Stilt fishing was the main source of income for residents of Weligama, but locals say it's becoming harder and harder to make ends meet solely through this traditional way of fishing. Now, it’s a busy fishing town, and you could easily spend a day wandering around, getting a feel for local life. The commercial area is small but vibrant; the fish stalls are both smelly and interesting.